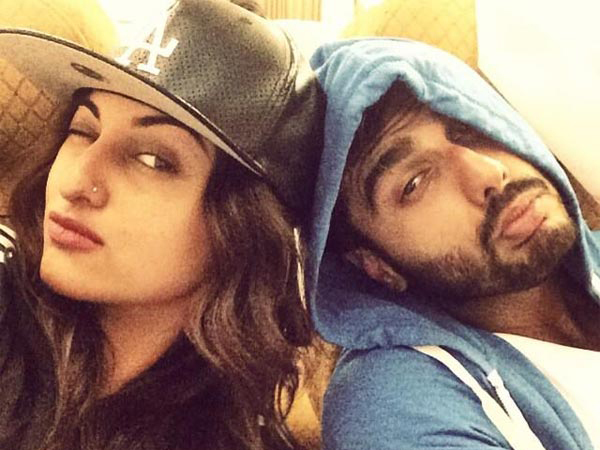 Tevar co-stars Arjun Kapoor and Sonakshi Sinha have been in limelight since they have started shooting for Tevar. Reports abuzz of their ‘bonding’ are everywhere. Amid all the rumors, Arjun clears that he is not dating Sonakshi. Arjun even clarified that they both know each other since childhood and they are family friends. The duo are currently shooting for Tevar which is produced by Arjun’s dad Boney Kapoor and uncle Sanjay Kapoor. The actors are often seen tweeting to each other and posting pics together, which has added quite a lot of fuel to the rumors. Tevar is an upcoming Indian action-romance film directed by Amit Sharma and written by Gunasekhar. The film stars Arjun Kapoor, Sonakshi Sinha and Manoj Bajpayee in lead roles. It is a remake of director Gunasekhar’s 2003 Telugu film Okkadu, starring Mahesh Babu and Bhoomika Chawla and Director Dharani’s 2004 Tamil Film Ghilli Starring Vijay and Trisha Krishnan both of which were commercial potboilers. The shooting of the film began on 21 January 2014 at sambhar lake in Jaipur, Rajasthan. The film’s shooting continued in different locations including Mumbai, Maheshwar, Agra, Mathura,Pandharpur at river side of Chandrabhaga and also in Haridas in Pandharpur (solapur,Maharashtra) Akluj (Solapur,Maharashtra). International Punjabi singer Imran Khan of Unforgettable album has recorded a track (LETS CELEBRATE) and also shot video for the same song. The film is scheduled for release on January 9, 2015.